I am by no means a marriage counselor. However, as a dentist, I encounter many desperate spouses suffering from sleep deprivation caused by a snoring spouse. When the non-snoring spouse realizes I might be able to provide a cure for snoring by using a MAD Device (similar to a mouth guard), they immediately want to sign their significant other up for the solution to the problem . Snoring, unfortunately, can put a lot of unnecessary strain on a marriage. People who are affected by lack of sleep display symptoms of poor mood, irritability, low energy, decreased libido, and poor judgment. Without a far stretch of the imagination, these symptoms can create havoc on any relationship. This is only the short list of sleep deprivation symptoms. There are many other areas lack of sleep can affect you physically. With that being said, getting a good nights sleep is important for your overall health and well being. Now let’s not forget the person doing the snoring. Most people with a snoring issues weren’t even aware this problem existed until receiving the complaint from their bed partner. For them, it feels out of their control as they can’t consciously control the issue. Ironically, it isn’t just the non-snoring spouse that is affected by poor sleep. The snoring spouse is also suffering from sleep deprivation and chances are over a much longer period of time. You need to understand that snoring is a condition of sleep apnea, sinusitis or nasal obstruction. All are treatable. Typically, snoring is caused by the relaxing of the muscles and soft tissues in the throat and mouth, making the airway passage smaller. The decrease in space through the airway makes it harder for each breath to get through, and when it does get through the airway passage, it moves over the soft tissues in the mouth and throat, causing a vibration that results in the snoring sound. There are other causes but this is the most common. How a MAD Device can Stop the Snoring? It’s the simplest and most non-invasive cure to treat snoring. 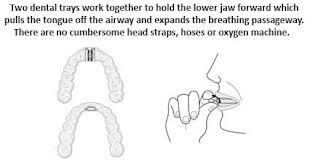 MAD devices (similar to a mouth guard) help shift the position of the jaw and reduce the vibration of the tissue that causes snoring. Each MAD device is made specifically for the person wearing it to provide comfort and optimal benefit for the user.